UDM Downloads > GSM Control! GSM Control is a all-in-one software solution that will incorporate usage of all your mobile's features and take it to the higher level. In order to establish communication between your Siemens mobile phone and your PC, you will need data cable or IrDA interface. Now you don't need to type on that small mobile's keyboard for hour or two when entering, lets say, 50 contacts in your mobile. Pull any information you want from your mobile. 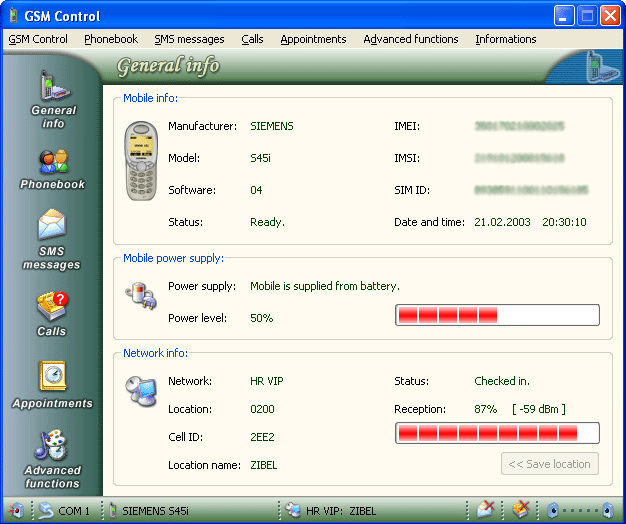 With GSM Control you can easily work with SMS messages, see your mobile's missed, received and dialed calls, work with appointments, check or set mobile's diverts, barrings or locks, set your new mobile's logo or ringtone, exchange your mobile's contacts and appointments with those from Microsoft Outlook, and many more. Take control of your mobile now!